Hamburger and hot dog food trucks can be very successful, but to set your business apart and take advantage of a niche, consider a theme, for example, regional, gourmet, paninis or waffles. To boost success, make it healthful food. Some exotic or custom food trucks make more money than those serving traditional American cuisine. In recent years, food trucks have developed into a popular culinary culture that extends beyond merely keeping hunger at bay. Many people may prefer buying food at a food truck rather than at a restaurant because the food truck’s branding resonates with them. Food trucks that are effective in communicating the added benefits they have to offer, including quick preparation and low prices, typically have no problem competing with established eateries and restaurants. If you own a food truck, the best way to let people understand your unique selling proposition is with a food truck theme. In this post, Truckster will discuss the most popular themes for mobile food trucks. If you want to attract customers and establish loyalty to your brand, continue reading to learn more. When people see that you are loyal to local producers, they will most likely be loyal to you. You may have to spend some time to add interest and excitement to this theme, but it’s easier if your community has a signature dish. For example, if you own a food truck in Mobile, Alabama, the chances are that people will appreciate a shrimp theme. In most cities, you will be able to find meat and vegetables from local producers. One of the reasons people tend to stay away from food trucks is because they are apprehensive about sugary and starchy foods fried in sunflower oil. By specializing in healthy foods and having a theme that showcases your commitment to providing healthy food and serving it in a way that is quick and convenient, you may attract a lot of new, loyal customers. Serving fancy meals from your food truck is one of the most effective ways of differentiating yourself from competitors. To be successful with a gourmet food truck, you have to perfect the art of serving high-quality food in a portable way. There are two critical requirements for a gourmet food theme: Stay away from traditional food truck meals, and use fresh ingredients. One way to promote your gourmet food truck theme is to appoint a qualified chef if you are not one yourself. The regional-themed food truck is a popular business model for ex-patriates from countries with traditional cuisine. Since people are inherently curious about cuisine from other countries, this theme typically performs well. To be successful with regional cuisine, you may have to do some research beforehand. If you are going to sell, for example, Chinese food in New York City, chances are you will face stiff competition. Sticking to, say, Moroccan or Hungarian theme, on the other hand, may have a higher chance of being profitable. There are several benefits to sticking to something as basic as paninis. These gourmet sandwiches are easy and affordable to prepare, they are popular among customers, and you can differentiate yourself from other panini themed food trucks with specialty products. With a panini theme, you appeal to the segment of the market that values quick delivery times and convenience. Like paninis, a waffle theme allows differentiation from your competitors because you can specialize in breakfast waffles, savory waffles, chicken fillers, or a wide range of waffle meals. You can serve waffles around the clock and in any setting, including public events, functions, and in downtown areas near corporate offices. 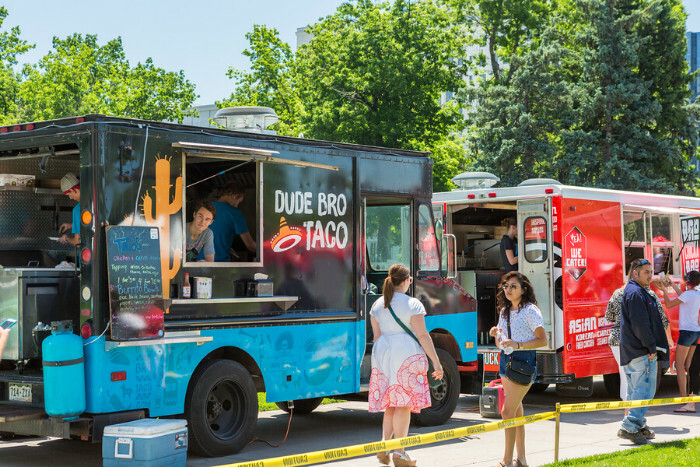 Choosing your food truck theme is the first step in starting a food truck business, as it determines the design of your food truck as well as your branding. Specialization will allow you to charge a premium on your products and build customer loyalty.